Western blot analysis of extracts from HeLa cells, transfected with 100 nM SignalSilence® Control siRNA (Unconjugated) #6568 (-), SignalSilence® CREB siRNA I #6588 (+) or SignalSilence® CREB siRNA II (+), using CREB (48H2) Rabbit mAb #9197 and α-Tubulin (11H10) Rabbit mAb #2125. 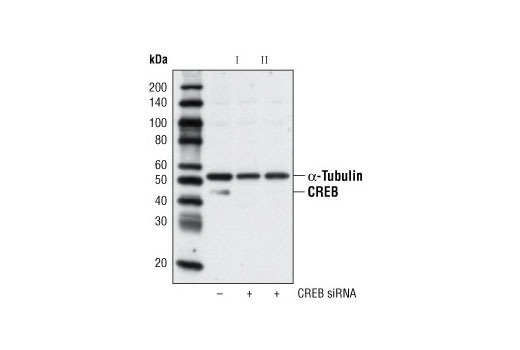 The CREB (48H2) Rabbit mAb confirms silencing of CREB expression and α-Tubulin (11H10) Rabbit mAb is used to control for loading and specificity of CREB siRNA. CST recommends transfection with 100 nM CREB siRNA II 48 to 72 hours prior to cell lysis. For transfection procedure, follow protocol provided by the transfection reagent manufacturer. Please feel free to contact CST with any questions on use.